These leatherette ladies wallets can be customized with any one of our patterns (many patterns are available in multiple colors). Of course adding personalization (free) is your choice - you can include a monogram (interlocking is my favorite), a name, or one of our beautiful name and initial combinations. 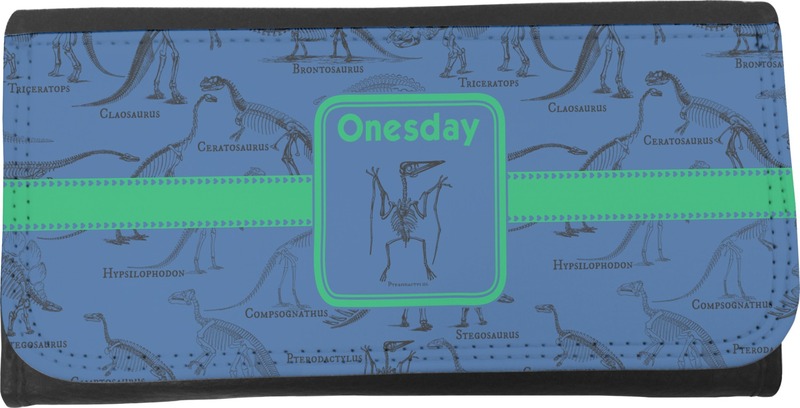 These beautiful wallets are a "z" shaped trifold design. The wallet is made of textured leatherette. The front section has a secure snap and opens up to a bill holder and zippered coins compartments. The back section has large flap with a secure snap on it. This section has 2 card holder compartments on either side of the wallet - one side will hold 7 cards, while the other section will hold 2 cards. Both sections also have additional compartments behind the cards section for additional bills, notes or extra cards. A checkbook cover is included and can be carried in this section or separately. It was perfect! It was exactly what I wanted. It was shipped to my home in a very timely manner. I am extremely pleased with my whole experience with my order. Very nice item. Purchased for friend's birthday. Cane very quickly. Friend was delighted with it. If you like dinosaurs, this is for you! This wallet is beautiful. The personalization was easy and looks fantastic. It even arrived earlier than expected. It was exactly what I ordered. Quality is great.